and cast on for the Dipped Infiinty Scarf. Thank you so much for so many helpful comments on different cast on techniques. In the end, I did a long tail cast on holding two different balls of yarn so I didn't have to worry about measuring or not having a long enough tail. I've only just started but I'm already loving the subtle look of holding the different shades together. Can you see the two different colors in the photo? I can't wait for the color changes to start! I think I'm going to make a zipped hoodie for Baby Starfish using the natural skein for trim. 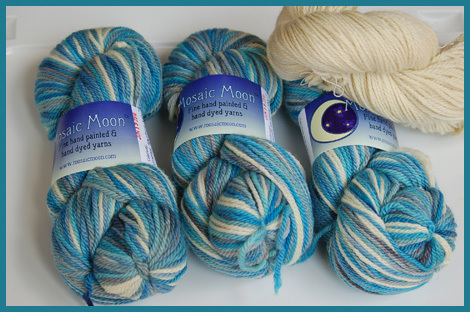 Mosaic Moon is definitely one of my favorite indie dyers. 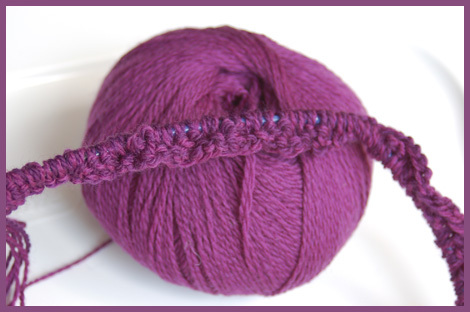 Morwenna has such an eye for color and she dyes SO MANY different colorways. I love your idea for the long tail cast on. I would have never have thought of that. Thanks. Beautiful yarn. Makes me wish once again that I knew how to knit. This page contains a single entry from the blog posted on August 6, 2010 3:15 PM. The previous post in this blog was Christmas in July - opinions needed please!. The next post in this blog is Vintage!.